With its excellent ability to nourish and moisturise even the driest of skin, Trilogy Certified Organic Rosehip Oil is the natural way to achieve and maintain a healthy, glowing complexion. 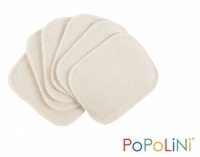 This totally natural product can also be used on babies with dry skin. Rosehip Oil is a natural skin oil that helps to improve the appearance of scars, stretch marks, wrinkles and dry skin. A combination of potent active ingredients and 100% natural formula make it highly effective for other skin concerns including ageing skin, dehydration, and uneven skin tone. Rosehip oil is rich in skin-loving nutrients to improve your overall skin condition. Omega 3 and Omega 6 Essential Fatty Acids: vital lipid compounds that moisturise dry skin and improve skin softness and elasticity. Essential Fatty Acids are vital for the health of our skin; however, our body is not able to reproduce them. Beta-carotene: a key nutrient for maintaining healthy skin and assisting in skin cell renewal and repair. Helps to repair skin suffering from the effects of sun damage and lifestyle stresses. The lipids found in Rosehip oil are similar to those found in your skin; therefore, it absorbs easily, leaving no oily residue. Who can use Trilogy Certified Organic Rosehip Oil? Trilogy Certified Organic Rosehip Oil may be used by the whole family, is safe to use during and after pregnancy to assist skin elasticity and reduce the appearance of stretch marks and is safe to use on babies to keep skin nourished and healthy and to help protect your baby’s skin from dryness. 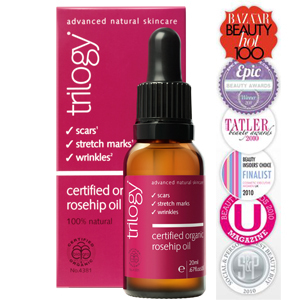 Trilogy Certified Organic Rosehip Oil can be used on the face and body. "A genius of a product, Trilogy Certified Organic Rosehip Oil is super nourishing and great for chasing away fine lines as well as stretch marks in pregnancy leaving skin feeling soft and subtle." 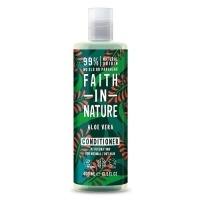 "Don’t go splashing your pennies on fancy chemical-laden products when this natural alternative does exactly what it says on the label"
"A truly exceptional product. Just a few drops work wonders."